I had the good fortune to attend the American Historical Association (AHA) conference in Washington, DC, this week. Michelle Delgado, a 7th-grade teacher at Edward Harris Jr. Middle School in Elk Grove, and I presented one of the lessons from the Sites of Encounter in the Medieval World unit. If you’d like to see what we have so far for Lesson 6 – Calicut, click SoE 6 – Calicut 2. I had never visited our nation’s capital before. I was delighted to get the chance to visit the Lincoln Memorial and the Vietnam Memorial. As many have said before me, the Lincoln Memorial was extremely moving. 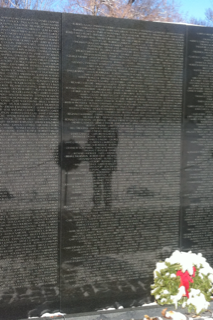 I was also deeply affected by the Vietnam Memorial, as that war dominated much of my youth. Michelle took a picture of the wall with my shadow on it. I share it here with you, as it was so unusual and oddly striking, at least to me! We are also very close to finishing the first lesson of the Sites of Encounter in the Medieval World unit. Look for an announcement soon about possibilities for piloting that lesson and other lessons during the spring. 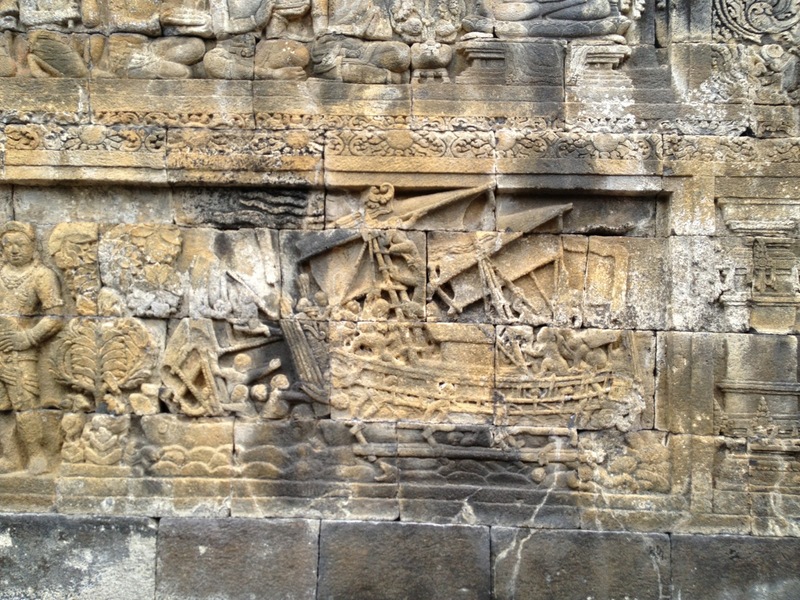 Citation: A relief showing a sailing ship from Borobudur, a temple in Magelang in central Java (in modern Indonesia). It was built as a shrine to the Buddha in the 9th century by the Sailendra dynasty which controlled central Java and its trade. Photograph courtesy of Professor Michael Vann, California State University, Sacramento.